For the current Legislative Council, see 6th Legislative Council of Hong Kong. The Legislative Council was first established in 1843 under the Charter of the British Colony of Hong Kong as an advisory council to the Governor. The powers and functions of the legislature expanded throughout its history. Today the main functions of the Legislative Council are to enact, amend or repeal laws; examine and approve budgets, taxation and public expenditure; and raise questions on the work of the government. In addition, the Legislative Council is also given the power to endorse the appointment and removal of the judges of the Court of Final Appeal and the Chief Judge of the High Court, as well as the power to impeach the Chief Executive of Hong Kong. Before the transfer of sovereignty of Hong Kong in 1996, a Provisional Legislative Council (PLC) was unilaterally set up in Shenzhen by the Government of the People's Republic of China as opposed to the 1995 elected colonial legislature. The PLC moved to Hong Kong and replaced the legislature after the Transfer of Sovereignty of 1997, until the next general election in 1998. Since 2000, the terms of the Legislative Council are four years. The Legislative Council of Hong Kong was set up in 1843 as a colonial legislature under British rule. Hong Kong's first constitution, in the form of Queen Victoria's Letters Patent (see Hong Kong Letters Patent), issued on 27 June 1843 and titled the Charter of the Colony of Hong Kong, authorised the establishment of the Legislative Council to advise the Governor of Hong Kong's administration. The Council had four Official members including the Governor who was President and Member when it was first established. The Letters Patent of 1888, which replaced the 1843 Charter, added the significant words "and consent" after the words "with the advice". The Legislative Council was initially set up as the advisory body to the Governor, and for the most of the time, consisted half of official members, who were the government officials seating in the Council, and half of unofficial members who were appointed by the Governor. After the Sino-British Joint Declaration was signed on 19 December 1984 (in which the United Kingdom agreed to transfer the sovereignty of Hong Kong to the People's Republic of China on 1 July 1997), the Hong Kong government decided to start the process of democratisation based on the consultative document, Green Paper: the Further Development of Representative Government in Hong Kong on 18 July 1984. The first ever elections to the Council were held in 1985, following by the first direct elections of the Legislative Council were held in 1991. The Legislative Council became a fully elected legislature for the first time in 1995. The People's Republic of China government did not agree with reforms to the Legislative Council enacted in 1994. Therefore, it withdrew the previous so-called "through-train" policy that would have meant that members elected to the colonial Legislative Council would automatically become members of the Hong Kong Special Administrative Region ("HKSAR") legislature. Instead, the Chinese government resolved to set up an alternative legislative council in preparation for the return of the sovereignty of Hong Kong from Britain to China. This body, the Provisional Legislative Council, was established by the Preparatory Committee for the Hong Kong Special Administrative Region (HKSAR) under the National People's Congress of the People's Republic of China in 1996. The Provisional Legislative Council, in operation from 25 January 1997 to 30 June 1998, initially held its meetings in Shenzhen until 30 June 1997. The Legislative Council of the HKSAR was established on 1 October 1998 under The Basic Law of the HKSAR. The first meeting of the Council was held in July of the same year in Hong Kong. Since the Basic Law came into effect, five Legislative Council elections have been held, with the most recent election being held on 4 September 2016. In 2010, the government's constitutional reform proposal became the first and only constitutional move was passed by the Legislative Council in the SAR era with the support of the pro-democracy Democratic Party after the Chinese government accepted the modified package as presented by the party, which increased the composition of the Legislative Council from 60 to 70 seats; increasing five extra seats in the directly elected geographical constituencies and five new District Council (Second) functional constituency seats which are nominated by the District Councillors and elected by all registered electorates. The most recent constitutional reform proposal, which suggested the electoral method of the Legislative Council remained unchanged, was vetoed in 2015. The first meetings of the Legislative Council of Hong Kong, from 1844 to 1846, were likely convened in the residence of Governor Pottinger (later to be the French Mission Building), still standing at Government Hill. From 1848 to 1954 (interrupted by renovation in 1928-9 and the Japanese occupation in 1941-5), it was housed on the upper floor of the Colonial Secretariat Building, Lower Albert Road, replaced in 1957 by the Annex to the Central Government Offices Main Wing, on the same site. In 1985, LegCo moved down to the nearby Old Supreme Court building in Central Hong Kong where it remained until November 2011. It took up residence in its present accommodation at the Legislative Block of the Central Government Complex, Tamar in December 2011. Unlike many other former and current Commonwealth legislatures, the Hong Kong Legislative Council does not have a ceremonial mace placed in its chambers. However, the high courts of Hong Kong use a mace to open sessions, and it represents the authority and powers of the court. To provide a long-term solution to the space shortage problem facing both the Government and the Legislative Council, the Government commissioned the Tamar Development for the design and construction of the Central Government Complex, the Legislative Council Complex and other ancillary facilities in 2008. The Legislative Council Complex comprises a low block and a high block: the low block, which will be named the Council Block, mainly houses conference facilities including the Chamber, major conference rooms, and communal facilities such as library, cafeteria and education facilities. The range of education facilities for visit by the public includes video corner, visitors' sharing area, exhibition area, children's corner, viewing gallery and access corridors, memory lane, education activities rooms and education galleries. The high block, which will be named as the Office Block, mainly houses offices for members and staff of the Legislative Council Secretariat. Officially opened on 1 August 2011, administrative staff had already taken occupation on 15 January 2011. The Legislative Council consists of 70 elected members. The term of office of a member is four years, except for the first term (1998 to 2000) when it was set to be two years (Article 69 of The Basic Law). In both the 2008 and 2004 elections, 30 members were directly elected by universal suffrage from geographical constituencies (GCs) and 30 were elected from functional constituencies (FCs). In the 2000 election, 24 were directly elected, six elected from an 800-member electoral college known as the Election Committee of Hong Kong, and 30 elected from FCs. Since the 2004 election, all the seats are equally divided between geographical and functional constituencies. According to The Basic Law, while the method for forming the Legislative Council shall be specified in accordance with the principle of gradual and orderly progress, the ultimate aim is to elect all Council members by universal suffrage (Article 68 of The Basic Law of Hong Kong). The GC seats are returned by universal suffrage. The voting system adopted in the electoral districts is a system of party-list proportional representation, with seats allocated by the largest remainder method using the Hare quota as the quota for election. The party-list proportional representation system is the most widely used form of proportional representation systems to facilitate the formation of a representative legislature. There were 3.37 million registered electors in the 2008 election. There are 29 FCs in the Legislative Council, representing various sectors of the community which are considered as playing a crucial role in the development of Hong Kong. Since the 2012 election, 27 FCs have returned one member, the Labour FC has returned three members and District Council (second) FC has returned five members, giving a total of 35 FC seats. A simple plurality system is adopted for 23 FCs, with an eligible voter casting one vote only. The exceptions are the Labour FC, in which a voter may cast up to three votes, and the Heung Yee Kuk, Agriculture and Fisheries, Insurance, and Transport FCs where a preferential elimination system is used due to the small number of voters. In the preferential elimination system, a voter must indicate preferences rather than approval/disapproval or a single choice. District Council (Second) uses the same voting rule in Geographical constituencies for the 5 seats. As of 2016, neither the Heung Yee Kuk nor the Commercial (Second) FCs have held an actual election, as only one candidate has stood for each FC in every election since their establishment in 1991 and 1985, respectively. In order to perform the important functions of scrutinizing bills, approving public expenditure and monitoring Government's work, a committee system is established. Andrew Leung, the incumbent President of the Legislative Council. From the establishment of the Legislative Council in 1843 to 1993, the Governor was the President and a member of the Council, and until 1917 the Governor was required to act with the advice but not necessary the consent of the Legislative Council. The Letters Patent of 1917 changed such practice by requiring the Governor to act "with advice and consent" of the Legislative Council. Under The Basic Law (Article 72), the President has the powers and functions to preside over meetings, decide on the agenda, including giving priority to government bills for inclusion in the agenda, decide on the time of meetings, call special sessions during the recess, call emergency sessions on the request of the Chief Executive, and exercise other powers and functions as prescribed in the rules of procedure of the Legislative Council. However, the president of the legislative council may not vote in most situations regarding government bills, and is encouraged to remain impartial towards all matters in the LegCo. The President of the Legislative Council has to meet the eligibility requirements set out in The Basic Law that he or she shall be a Chinese citizen of not less than 40 years of age, who is a permanent resident of the HKSAR with no right of abode in any foreign country and has ordinarily resided in Hong Kong for a continuous period of not less than 20 years. The President is elected by and from among Council members. The first President (1997–2008) was Rita Fan; the incumbent President, elected in 2016, is Andrew Leung of the pro-Beijing Business and Professionals Alliance for Hong Kong. In a controversial move directed at reining in democratic legislators (most of whom were elected by universal suffrage and six of whose seats had been vacated by a controversial court order of disqualification), amendments to the Rules of Procedure were passed on 15 December 2017 giving sweeping powers to the President to control the business of the legislature. Among them is the power to vet proposed motions and amendments to bills, require legislators to explain them and to reject or merge them. Prior notice must be given of any notice of motion and the President may reconvene the chamber immediately after any failure to meet quorum. Under the undemocratic election system of the legislature, the role of president has been occupied by pro-Beijing members since 1997. The quorum for meetings of the Council is 20, i.e. only 28 per cent of membership, having been reduced from 35 on 15 December 2017. Passing of government bills requires only a simple majority whereas private members' bills and motions have to be passed by majorities of members in both the geographical and functional constituencies independently, entrenching pro-Beijing interests. After the 15 December 2017 amendments to procedure, the setting up of investigative committees requires 35 signatures of members, effectively blocking democrat-sponsored scrutiny of government action. 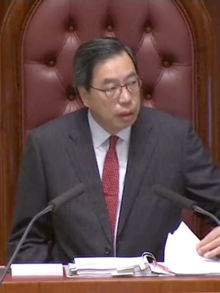 Amendments to The Basic Law require a two-thirds vote in the Legislative Council, without a specific requirement in each group of constituencies. After passing the Council, the Basic Law amendment must obtain the consent of two-thirds of Hong Kong's deputies to the National People's Congress, and also the Chief Executive (the Chief Executive is vested with the veto power). Traditionally, the President does not vote. However, this convention is not a constitutional requirement. The latest election was held on 4 September 2016. The pro-Beijing camp retained control of the Legislative Council with the Democratic Alliance for the Betterment and Progress of Hong Kong (DAB) as the largest party. 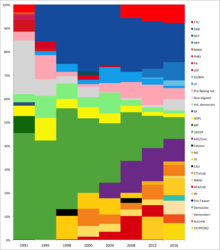 Vote share of the Legislative Council elections by party since 1991. Seating plan of the Legislative Council. In a typical Council meeting in the old Legislative chamber, members were seated to the left and front of the President's chair in the Chamber patterned after the adversarial layout of Westminster system legislatures. The three rows to the right were reserved for government officials and other people attending the meetings. At the new LegCo site at Tamar, members sit facing the President (and council officers) in a hemicycle seating arrangement. At present, the Secretariat, headed by the Secretary General, provides administrative support and services to the Council through its ten divisions. In addition to being the chief executive of the Secretariat, the Secretary General is also the Clerk to the Legislative Council responsible for advising the President on all matters relating to the procedure of the Council. The following chart lists the composition of the Legislative Councils of Hong Kong since the Special Administrative Region (SAR) period from 1998, the composition indicate the seats controlled by the camps (green for the pro-democracy camp and red for the pro-Beijing camp) at the beginning of the sessions, while the diagrams indicate the composition when the council was dissolved. Services to members were originally provided by the Office of the Clerk to the Legislative Council which was part of the Government Secretariat. Additional support later came from other administrative units, i.e. the Unofficial Members of the Executive and Legislative Councils (UMELCO) Secretariat and its variants, in consideration of the gradually rising volume of work in Council business. With the establishment of UMELCO in 1963, public officers were seconded to UMELCO to assist members to deal with public complaints and build up public relations with the local community. During their secondments, public officers took instructions only from Council members. The practice remained when the Office of the Members of the Executive and Legislative Councils (OMELCO) replaced UMELCO in 1986. In 1991, the OMELCO Secretariat was incorporated. As a result of the complete separation of membership of the Executive and Legislative Councils, OMELCO was renamed the Office of Members of Legislative Council (OMLEGCO). The Legislative Council Commission, a statutory body independent of the Government, was established under The Legislative Council Commission Ordinance on 1 April 1994. The Commission integrated the administrative support and services to the Council by the Office of the Clerk to the Legislative Council and the OMLEGCO Secretariat into an independent Legislative Council Secretariat. The Commission replaced all civil servants by contract staff in the 1994–1995 session. ^ "Facts about the Election". Elections.gov.hk. ^ a b "LegCo Today". Legislative Council Commission. ^ a b c d "History of the Legislature". Legislative Council. Retrieved 30 April 2013. ^ "A Companion to the history, rules and practices of the Legislative Council of the Hong Kong Special Administrative Region - Part I: An introduction to the Legislative Council, its history, organisation and procedure - Chapter 3". Legislative Council Commission. ^ "HISTORY OF THE LEGISLATIVE COUNCIL". Legislative Council of Hong Kong. ^ "Legislative Council of the Hong Kong Special Administrative Region - The Establishment of the Provisional Legislative Council". The Legislative Council Commission. ^ "Heritage Impact Assessment" (PDF). LWK Conservation Ltd. Retrieved 11 October 2014. ^ "The Legislative Council Building" (PDF). Legislative Council Secretariat. ^ Chap. 542, s. 51 of the Legislative Council Ordinance: "an elector may vote for as many candidates as there are vacancies and no more"
^ "LegCo Today". Legislative Council of the Hong Kong Administrative Region. Retrieved 10 March 2018. ^ "President of the Legislative Council". The Legislative Council Commission. ^ a b c Cheng, Kris (15 December 2017). "Hong Kong legislature passes controversial house rule changes taking powers from lawmakers". Hong Kong Free Press. Retrieved 16 December 2017. ^ "HOW LAWS ARE MADE" (PDF). Legislative Council of Hong Kong. ^ "THE BASIC LAW OF THE HONG KONG SPECIAL ADMINISTRATIVE REGION OF THE PEOPLE'S REPUBLIC OF CHINA" (PDF). ^ Michael DeGolyer (24 July 2008). "Legco dice loaded from the start" Archived 7 December 2008 at the Wayback Machine. The Standard. ^ "Knowledge of the Legislative Council". Legislative Council Commission. ^ "Legislative Council Secretariat". The Legislative Council Commission. ^ "Possible duplication of work of the LegCo Redress System with the work of The Office of The Ombudsman" (PDF). Legislative Council of Hong Kong. ^ "The Legislative Council Commission". Legislative Council Commission.